The capability of the binding oxygen molecule, with the heme proteins, is what makes a difference in both the molecules. Haemoglobin is called as tetrameric hemoprotein, while myoglobin is called monomeric protein. Haemoglobin is found systematically all over the body, while myoglobin is found in muscles tissues only. Haemoglobin is made of protein and prosthetic group and is well known for carrying oxygen pigment. It is the most vital part to sustain life as it works in transporting oxygen as well carbon dioxide throughout the body. Myoglobin works for muscles cells only, by receiving oxygen from the RBC and further carry it to a mitochondrial organelle of muscles cells. Subsequently, this oxygen is used for cellular respiration to create energy. In this article, we will consider the remarkable points which differentiate the haemoglobin and myoglobin. Number of chains Haemoglobin has 4 chains of two different types- alpha and beta, delta, gamma, or epsilon (depending on the type of hemoglobin). It contains single polypeptide chains. Type of structure A tetramer. A monomer. Binds Binds CO2, CO, NO, O2 and H+. Binds to O2, tightly and firmly. Their presence Systemically all over the body. In muscles cells. Types of curve Sigmoid binding curve. Hyperbolic curve. Role Haemoglobin is transported along with blood to whole body and carry oxygen. Myoglobin supplies oxygen to muscles only, which is helpful at the starving time of oxygen. Concentration in blood High in RBC. Low. 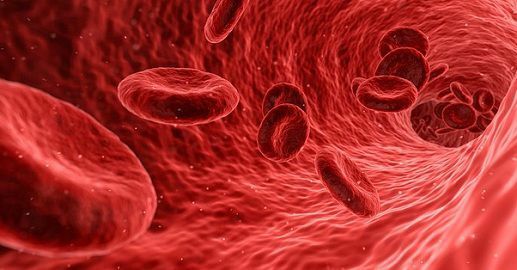 Haemoglobin is the heme protein molecules found in red blood cells, carrying oxygen from the lungs to the body’s tissue and returns carbon dioxide from the tissue back to the lungs. Haemoglobin has less affinity for binding oxygen and its concentration is higher in RBC (red blood cells). So when oxygen binds to the first subunit of haemoglobin, it changes into the quaternary structure of the protein and thus making easier for other molecules to bind. There should be a standard level of Hb present in one’s body, which may range widely according to the age and gender of the person. Anemia is the condition where the level of Hb or red blood cells present in the blood gets down. Hemoglobin contains a heme group which is a protein and held noncovalently. The difference lies in the globin part that has the different arrangement of amino acids in different animals. ‘Heme‘ is the central iron, hook up with four pyrrole rings. The iron is in the form of a ferric ion, while the pyrrole rings are attached by methylene bridges. Globin– the protein part, is a dimer of heterodimer (alpha-beta) which means four proteins molecules are connected in which two alpha globulin and other two can be beta, delta, gamma or epsilon-globulin chains can be present which depends on the type of haemoglobin. This globulin chain contains ‘porphyrin’ compound which contains iron. Haemoglobin (humans) consist of two alpha and two beta subunits where each alpha subunit has 144 residues and beta-subunit has 146 residues. It helps in transportation of oxygen throughout the body. It gives colour to the blood. Haemoglobin act as a carrier for carrying oxygen as well as carbon dioxide. It plays a role in erythrocyte metabolism. They act as physiological active catabolites. Myoglobin is a kind of heme proteins, serving as an intracellular storage site for oxygen. During the deprivation of oxygen, the bound oxygen called as oxymyoglobin is released from its bound form and further used for other metabolic purposes. As myoglobin has tertiary structure, which is easily soluble in water, in which its characters which are exposed on the surface of the molecules are hydrophilic while those molecules which are packed into the interior of the molecule are hydrophobic in nature. As already discussed it is a monomeric protein having a molecular weight of 16,700, which is one-fourth to that of haemoglobin. It consists of non-helical regions, from A through H which is right-handed alpha helices, and 8 in number. Though the structure of myoglobin is similar to that of haemoglobin. Myoglobin also has the protein called heme, which contains iron and gives red and brown colour to the proteins. It exists in the secondary structure of protein having a linear chain of amino acids. It contains one subunit of alpha helices, and beta sheets and presence of hydrogen bond marked its stabilization. Myoglobin helps in transportation and in storing of oxygen in muscles cells, which helps during the working of muscles by providing energy. The binding of oxygen is more tightly with myoglobin because venous blood combines more firmly than haemoglobin. Myoglobin is mostly found in muscles, which is useful for the organisms in during shortage of oxygen. Whales and seals contain a high amount of myoglobin. The efficiency of supplying oxygen is lesser as compared to that of haemoglobin. Myoglobin has a strong affinity for binding for oxygen, which makes it able to store it effectively in muscles. It helps body at the starving situation of oxygen, especially in the anaerobic situation. Carry oxygen to the muscles cells. Also, help in regulating body temperature. Both the molecules have oxygen binding ability, as discussed above, following are the key differences. Haemoglobin has four chains of two different types- alpha and beta, gamma, or epsilon (depending on the type of haemoglobin) and makes a structure of tetramer, while myoglobin contains single polypeptide chain so called a monomer, though both have the central ion as iron and ligand of binding as oxygen. Haemoglobin binds with O2, CO2, CO, NO, BPH and H+, while myoglobin binds with O2 only. It supplies haemoglobin along with blood systemically all over the body while myoglobin supplies oxygen to muscles only. Haemoglobin which is also known as Hb is present in higher amount in RBC than myoglobin also known as Mb. Haemoglobin is transported along with blood to all parts of the body, also helps in transporting oxygen; Myoglobin provides oxygen to muscles only which is helpful when there is a lot of requirement of oxygen by blood. Both contain Iron-containing protein as their central metal. Both have the ligand as Oxygen (O2). Thus we can say that haemoglobin and myoglobin are equally and physiologically important, because of their ability to bind oxygen. These were the first molecules whose three-dimensional structure was discovered through X-ray crystallography. Abnormalities in the constituents may lead to severe disease and disorders.